Snuggled just six miles from the base of Turtleback Mountain and sprawling throughout the wide open landscapes of the high desert, Sierra Del Rio honors the majestic spirit of the wild southwest. 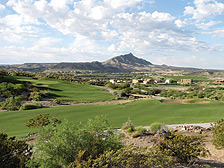 Located in Elephant Butte, NM within the 1,000 plus acres of Turtleback Mountain Resort, Sierra Del Rio Golf Course, is an 18-hole championship daily fee facility with full amenity clubhouse. In New Mexico we appreciate our natural resources—both for their beauty and for the life they give. For this reason, we have designed a course that is unique not only in its play design but also in it limited impact on our environment. At Sierra Del Rio, we use environmentally safe organic products throughout the property to protect our water shed and abundant wildlife. Our beautiful southern New Mexico climate combined with our draught tolerant grasses allows the course to maintain its green coloring throughout the year. The organically grown greens are covered with “bent” grass that offers some of the smoothest putting surfaces found in this part of the country. At Sierra Del Rio, we believe that playing golf should be a beautiful experience—one that allows you to immerse yourself in a game among a unique design of greens, fairways, and teeing grounds but also one where you will bask in the natural and abundant landscapes that quietly and majestically surround your play. Our design team has created a premier course with 18 memorable holes while preserving the natural environment that has existed here for ages. 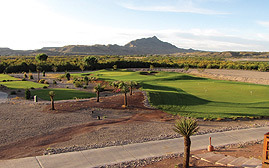 At Sierra Del Rio, not only will you savor each minute of play, you will find peace in the awesome vistas as you lose yourself in our high southwestern desert oasis. Getting There: Halfway between Albuquerque and El Paso. Take I-25, exit at either #79 or #83 to Elephant Butte Lake. 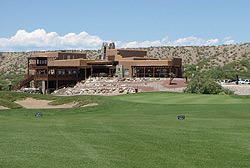 Sierra del Rio Golf course is just off of Warm Springs Road.